“They broke in on me, and found me doing an unholy thing.” — Im-Ho-Tep, THE MUMMY. 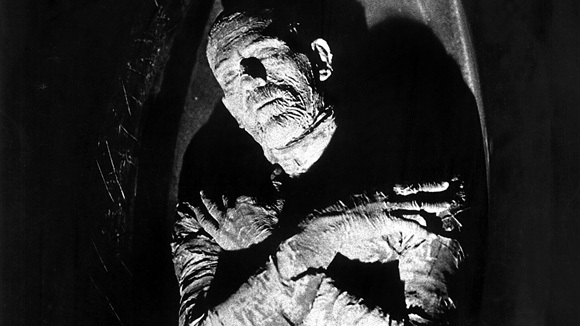 THE MUMMY arrived a year after the one-two punch of Universal’s DRACULA and FRANKENSTEIN, both in 1931. It’s a fascinating case, because while it is a major departure from those two films, it also couldn’t exist without them. THE MUMMY has both nothing and everything to do with DRACULA and FRANKENSTEIN. DRACULA and FRANKENSTEIN were such massive successes for Universal that the studio started looking around for other intellectual properties to turn into the next great horror character. DRACULA had come from the legendary 1897 novel by Bram Stoker, and FRANKENSTEIN had been the great creation of Mary Shelley in 1818. Universal had seen prior success with 1923’s THE HUNCHBACK OF NOTRE DAME, which was not technically a horror movie but is still to this day a terrific entertainment with a great Lon Chaney performance, and with 1925’s THE PHANTOM OF THE OPERA, which is most definitely a horror movie and also has a great Lon Chaney performance, but realistically, The Phantom is probably considered by most to be a distant second-stringer behind Frank, Drac, and Im-Ho-Tep. 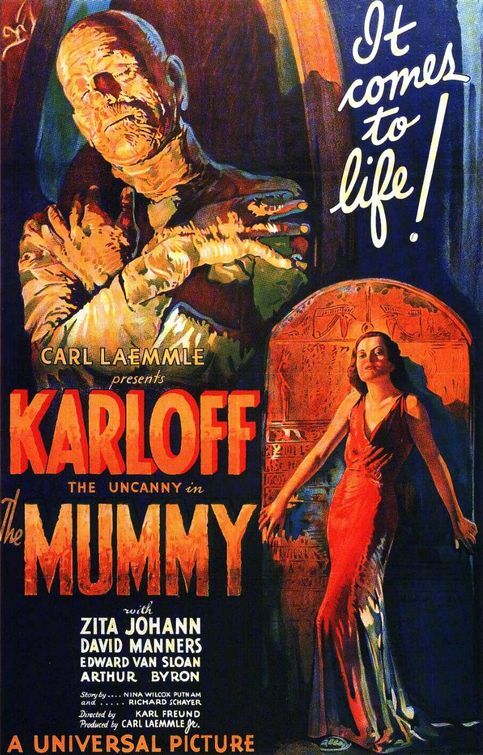 The inspiration for 1932’s THE MUMMY, unlike all of Universal’s major horror hits up until that time, came not from literature but from actual human history. Ten years earlier, in 1922, the landmark discovery of the tomb of the Egyptian pharaoh Tutankhamen was a national sensation, as big a story to Americans then as Kanye’s relationship with Kim is to Americans nowadays. Inspired by the King Tut finding, Universal’s story department (primarily Richard Shayer and Nina Wilcox Putnam) came up with the basic concept from which John Balderston wrote the final script. Balderston reportedly contributed to the scripts of DRACULA and FRANKENSTEIN also, and THE MUMMY shares not only a writer with those films, but also a cinematographer and a supporting cast (DRACULA) and of course a star (FRANKENSTEIN). Karl Freund is not generally considered an auteur director, the way DRACULA‘s Tod Browning and FRANKENSTEIN‘s James Whale are, but he’s earned his place at the horror round table. Freund was the cinematographer on DRACULA, and he reportedly took over the director’s chair for scenes where Browning’s alcohol troubles disrupted filming. 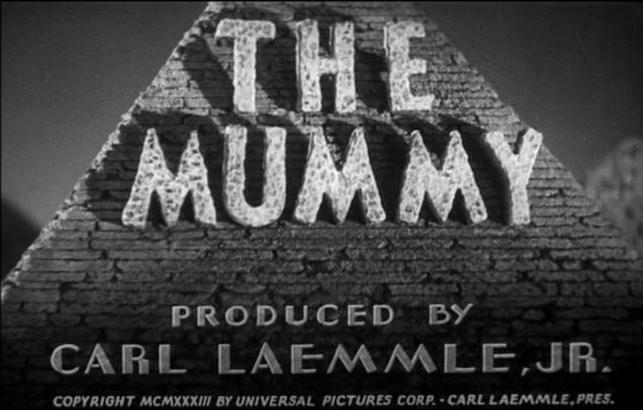 Freund as a director may not have had the same creativity and affinity for the bizarre that Browning and Whale did, but his acuity with making dark horror scenes stylish as a cameraman is certainly a boon to THE MUMMY. Still, the twin shadows of DRACULA and FRANKENSTEIN loom large over THE MUMMY. If Jack Pierce’s masterpiece was the make-up design for FRANKENSTEIN, his work in THE MUMMY must surely be a close second. It’s as thoughtful as the design on the earlier film — though it’s obviously not a strictly realistic take on what a millenium-old mummified human being would look like, it’s a fitting approximation of how most people would imagine one. It’s a figure from our imagination, come alive. It’s a truly striking image. But it can’t have been fun for poor Boris Karloff to slog on every day, so the movie doesn’t linger on this visage of The Mummy for long. 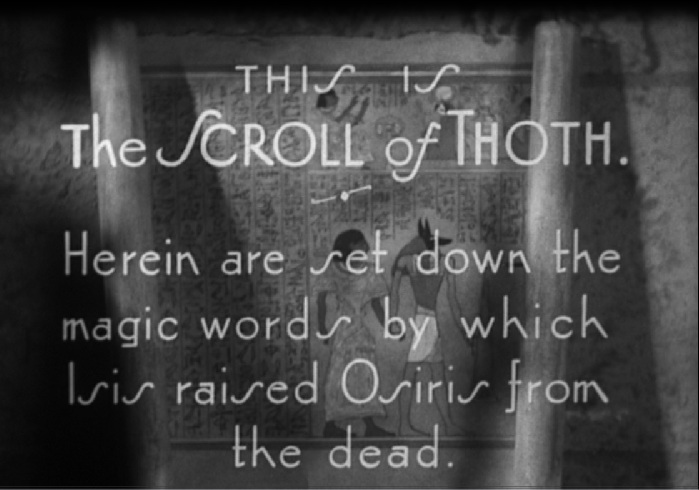 As the story goes, one of the more headstrong adventurers, against the warnings of Dr. Muller (Edward Van Sloan, who played Van Helsing in DRACULA), reads aloud an incantation from the ‘Scroll Of Thoth’ that brings Im-Ho-Tep lumbering back to life. The Mummy strolls out of the sarcophagus, then shuffles his way out the door. The sight of the impossible drives the archaeologist mad, and he begins cackling wildly, maniacally, as The Mummy escapes. It’s an over-the-top capstone to the scene, but one that fits in neatly with both director Karl Freund’s background in German Expressionism and the example of the madman Renfield in DRACULA. When Im-Ho-Tep re-enters the movie, he’s amped down the Mummy look considerably (perhaps as a concession to Mr. Karloff, who after all was as big a star in 1932 as Jennifer Lawrence is in 2016). Im-Ho-Tep is now cutting a more dapper figure, clad in fine robes and a fez and introducing himself as “Ardeth Bey,” which does makes me think a little bit of how Mos Def is now going by the name “Yasiin Bey.“ That’s just how my mind works. 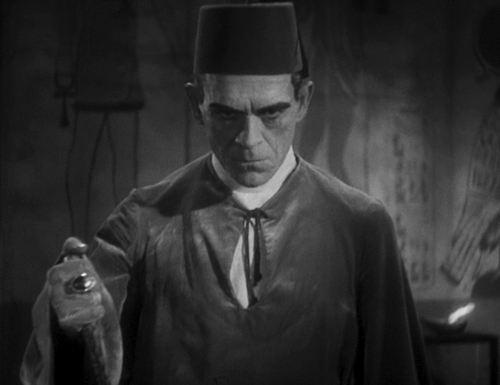 Anyhow, Ardeth Bey is much more eloquent than the initial Mummy from the first scene, and the more civilized incarnation of the character gives Karloff the chance to show what he can do with a line like “With your pardon, I dislike to be touched. An Eastern prejudice.” He’s a far better actor, in my opinion, than he gets credit for being. The thing is, Ardeth Bey is a man on a mission, and don’t let his fancy diction fool you, he’s not the greatest guy. Or maybe you can tell just by looking at him. 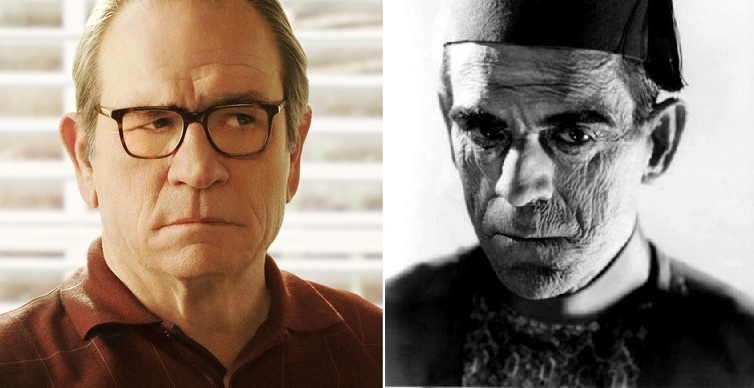 Honestly, doesn’t he look a bit like Tommy Lee Jones, circa that HOPE SPRINGS poster? Since every Tommy Lee Jones needs his Meryl Streep, Im-Ho-Tep searches the entirety of Cairo for his immortal beloved, Ankh-Es-Un-Amon. He finds her at a party, in the person of Helen (Zita Johann), who is also being wooed by Frank (Paul Rudd look-alike David Manners, who played Harker in DRACULA). Frank is the son of one of the archaeologists who exhumed Im-Ho-Tep, and he and Dr. Muller become rightly convinced not only that Ardeth Bey is the returned Im-Ho-Tep, but also that he is after Helen. If this is starting to sound a little dry, that’s appropriate because that’s how it plays. For whatever reason, THE MUMMY lags more than its predecessors (and more than its several sequels). There is a lot of exposition, a lot of scenes of people hunched over scrolls, and not all of it compelling. There are a few highlights, though. There’s the delightfully over-wrought line, highlighted in the classic trailer, where Ardeth Bey lays out his intentions to Helen, “I shall awaken memories of love and crime and death.” There’s the still-disturbing scene, a flashback to ancient Egypt, where Im-Ho-Tep is captured and wrapped in bandages and buried alive — it’s not shocking by today’s standards, but if you stop to give some thought to how that process might actually feel, you might be able to approximate how frightful such a scene might have been in 1932. And there’s “The Nubian”, a memorable if somewhat as-the-woke-kids-say problematic character who is a servant to one of the archaeologists but is compelled by Ardeth Bey to do his bidding. (Like Count Dracula, Im-Ho-Tep has hypnotic abilities.) 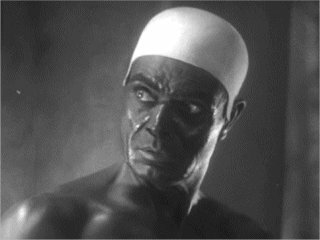 The Nubian is played by Noble Johnson, a black actor of an unforgettable countenance who was also seen in 1932’s THE MOST DANGEROUS GAME (from the team who would next make KING KONG.) Unfortunately, this was long before Hollywood movies figured out how to showcase black actors in any remotely flattering way. So The Nubian is a very physical character, no pushover, but a plot device, a prop, a type, not in any other way delineated. It’s arguably refreshing to have a splash of color in an early horror movie, a genre that is otherwise very very Caucasian, but that may not be saying much. But back to the story. In the end, Frank, Dr. Muller, and Helen confront Im-Ho-Tep, and since Frank and Dr. Muller are powerless to stop Im-Ho-Tep, it falls to Helen to remember her past life as Ankh-Es-En-Amon and invoke the god Isis to destroy Im-Ho-Tep. (If the movie doesn’t have much for the black character to do, at least the lone female character is the one with the hero moment.) A statue of Isis raises an arm and shoots light at Im-Ho-Tep, who starts aging rapidly — you get to see his skeleton! — before completely disintegrating (off-camera). And that’s THE MUMMY. Karl Freund only directed a few more movies before returning to his post as cameraman on movies like 1948’s KEY LARGO. The only major player to return to the character was Jack Pierce. While he did return to playing Frankenstein’s Monster (in SON OF FRANKENSTEIN), Karloff never did reprise the role of The Mummy. The character would return in several unofficial sequels, with Lon Chaney Jr. eventually taking over the role. Beyond the Mummy pictures of the 1930s and 1940s, however, the character accumulated in popularity and became a Halloween-time standard. 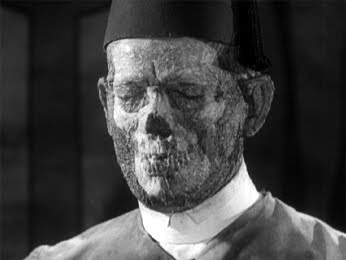 THE MUMMY, taken as a film on its own, may not quite be as timeless as some of the other Universal horror pictures, but the work of Freund, Karloff, Pierce, and their collaborators ensured that The Mummy would become as iconic a figure as Count Dracula, Frankenstein’s Monster and his Bride, the Wolfman, and The Creature From The Black Lagoon. He’s a pantheon character, as eerily lovable and oddly romantic as any of them.